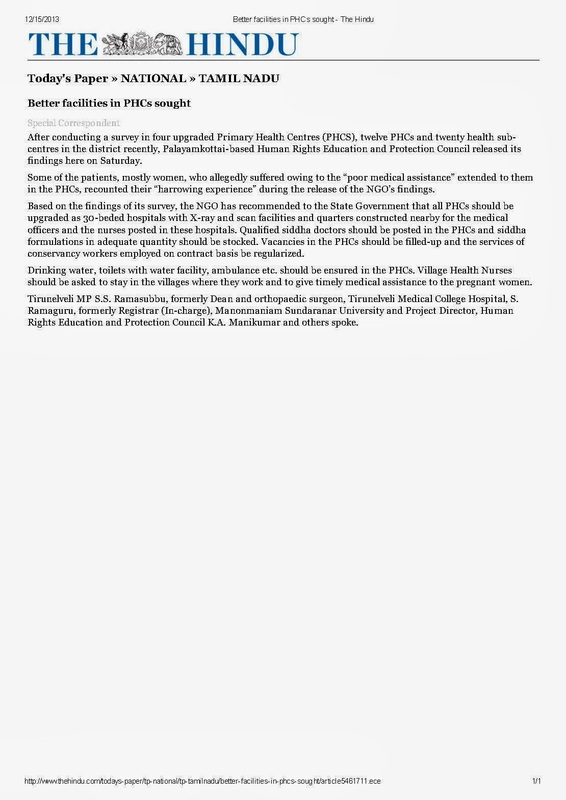 After conducting a survey in four upgraded Primary Health Centres (PHCS), twelve PHCs and twenty health sub-centres in the district recently, Palayamkottai-based Human Rights Education and Protection Council released its findings here on Saturday. Some of the patients, mostly women, who allegedly suffered owing to the “poor medical assistance” extended to them in the PHCs, recounted their “harrowing experience” during the release of the NGO’s findings. Based on the findings of its survey, the NGO has recommended to the State Government that all PHCs should be upgraded as 30-beded hospitals with X-ray and scan facilities and quarters constructed nearby for the medical officers and the nurses posted in these hospitals. Qualified siddha doctors should be posted in the PHCs and siddha formulations in adequate quantity should be stocked. Vacancies in the PHCs should be filled-up and the services of conservancy workers employed on contract basis be regularized. Drinking water, toilets with water facility, ambulance etc. should be ensured in the PHCs. Village Health Nurses should be asked to stay in the villages where they work and to give timely medical assistance to the pregnant women. Tirunelveli MP S.S. Ramasubbu, formerly Dean and orthopaedic surgeon, Tirunelveli Medical College Hospital, S. Ramaguru, formerly Registrar (In-charge), Manonmaniam Sundaranar University and Project Director, Human Rights Education and Protection Council K.A. Manikumar and others spoke.